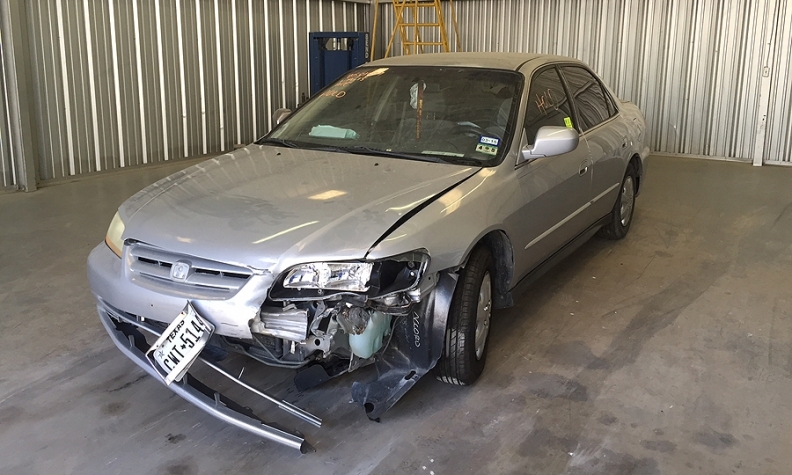 According to a Texas lawsuit, this 2002 Honda Accord was in a "relatively minor" collision that became fatal because of a defective airbag inflator made by Takata. WASHINGTON (Bloomberg) -- U.S. regulators’ push for a second recall of 2.1 million cars and trucks whose airbags could go off while driving delivered more cautionary tales about a complex life-saving technology that’s had a very bad year. The National Highway Transportation Safety Administration held an unusual Saturday press briefing to warn the public that an earlier recall of nine models from Fiat Chrysler, Honda Motor Co. and Toyota Motor Corp. didn’t work entirely. The agency is asking vehicle owners who haven’t completed the first repair to do so now. That may mean a second trip to the dealership for consumers, assuming replacement parts for the new fix are available, which they may not be until year-end. Added to the mix: Some of the cars being recalled for a second time were part of last year’s massive 10-automaker recall of Takata Corp. airbags for a different defect: inflators that could explode with deadly results. It’s the biggest challenge to the technology since the mid-1990s, when NHTSA began investigating reports that first-generation airbags deployed with such force that children and small adults riding in front seats were being killed and, in some cases, decapitated. The latest recall involves the Acura MDX, Dodge Viper, Jeep Grand Cherokee, Jeep Liberty, Honda Odyssey, Toyota Corolla, Toyota Matrix, Toyota Avalon and Toyota-made Pontiac Vibe, from 2002 to 2004 model years, NHTSA said. All of the vehicles were made with an electronic component from TRW Automotive Holdings Corp. The Vibe was manufactured at a plant operated as a joint venture between Toyota and General Motors Co.
“TRW is supporting its customers in these recalls fully, and will cooperate with NHTSA and provide information to the agency if requested,” John Wilkerson, a spokesman for TRW, said in an e-mailed statement. About 1 million of the Honda and Toyota vehicles listed on Saturday were previously recalled for defective Takata airbags, the agency said. General Motors recalled at least 7 million vehicles in North America last year to fix faulty ignition switches that could cut power and disable airbags. The Takata airbag defect led 10 automakers to issue recalls over complaints that inflators could explode and send shrapnel at drivers and passengers. A fifth U.S. fatality from such incidents was confirmed by Honda last week. More than 24 million vehicles with Takata airbags have been recalled globally since 2008, according to Reuters estimates. Two U.S. senators who have pushed for a more aggressive policing of the auto industry by NHTSA praised regulators for acting decisively. They said the agency must ensure replacement parts are manufactured more quickly and automakers are subject to enforceable, nationwide recalls for all affected vehicles. “We remain concerned for the more than 12 million car owners who are driving vehicles with defective Takata air bags,” said U.S. Sens. Edward Markey, D-Mass., and Richard Blumenthal, D-Conn. There haven’t been any fatalities linked to the TRW defect, Rosekind said Saturday in a call with reporters. In nine incidents, Takata-made airbags have ruptured in the latest group of cars being recalled, leading to three injuries, including one with serious eye damage, according to the agency. NHTSA has identified 39 cases in which a vehicle fixed under an earlier TRW recall had air bags deploy in non-crash situations, Rosekind said. NHTSA discussed its investigation with Toyota, Honda and Chrysler this past week, urging them to issue new recalls and make more effective repairs, Rosekind said. Automakers now will replace the entire electronic-control module instead of adding filters or wire harnesses to reduce electrical interference, the agency said. Fiat Chrysler posted a statement on its website confirming the recall of about 928,497 Jeep and Dodge vehicles, most of them in the U.S., Canada and Mexico. The company said it would “upgrade a repair performed as part of a 2012 recall” and said new control modules are being developed. Honda has received a small number of complaints of inadvertent airbag deployment in its vehicles after the original recall repair was completed, according to a statement on the automaker’s website. These vehicles are equipped with computer chips similar to those used by other manufacturers, according to the statement. The airbag deployments haven’t resulted in crashes, it said. John Hanson, a U.S. spokesman for Toyota didn’t respond to phone or e-mail messages from Bloomberg outside of regular business hours requesting comment on the recall. It may take until the end of 2015 for all replacement parts for the recall to be available, Rosekind said, although the agency is working with automakers to speed up the timetable. NHTSA is urging vehicle owners to get the earlier repair in the meantime. The added shielding for electronic components may be 85 percent effective, Rosekind said. Still confused? Go to NHTSA’s website for a fact sheet, or call the agency at 1-888-327-4236. “This really highlights for us that you can have a recall and a remedy, and you still need NHTSA’s ongoing vigilance to make sure it’s fully effective,” Rosekind said.